The video is our experiences testing the infrastructure of the system before implementing it in the clients home. We wanted to see how large we could scale this system if we were to leave it completely wireless. We found that streaming 5 separate HD streams concurrently from a single source over wireless n was able to operate at a level significantly under the capacity of the network. This was just an experiment as the final implementation had wired drops in every room of the house, so none of the streaming actually took place over the wireless. This project was done in collaboration with Collin Ruffenach of Swift Consulting. 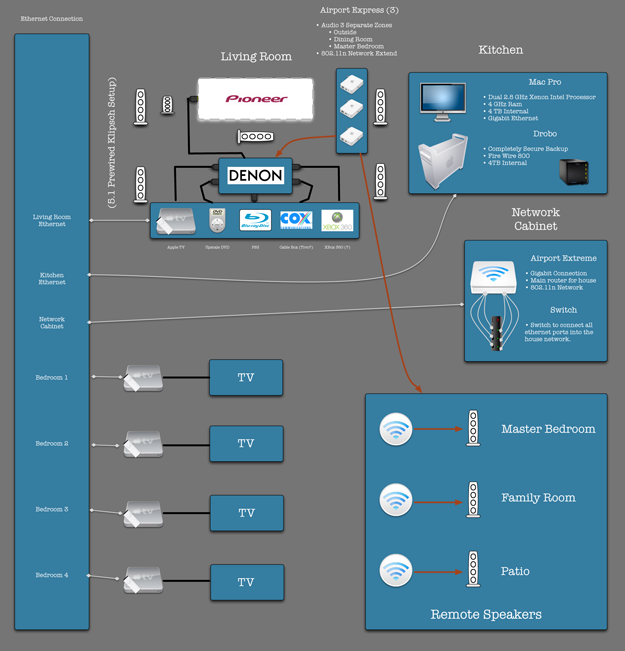 Below is a diagram of the final installation.